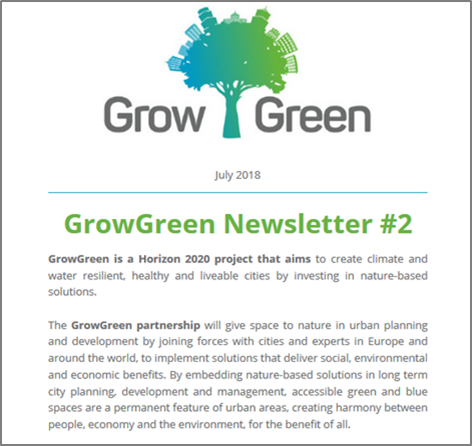 The second edition of the GrowGreen newsletter was recently released to showcase what we’ve achieved as we finish the project’s first year and to highlight news and upcoming events from the world of nature-based solutions. The newsletter features key developments in the project so far, including the outcomes of our meeting in Valencia to discuss upscaling nature-based solutions, a short video about the parks and green streets that will be implemented in Wroclaw and what happened when we consulted residents in Manchester about their existing green spaces. Also included are important studies and reports that guide our work, on the topics of climate change in Europe, the benefits of nature-based solutions, and financing. Interesting upcoming events to add to the diary include the World Water Week in August, the Smart City Expo World Congress in November and the World Forum on Urban Forests in November/December. Sign up for future editions of our newsletter by subscribing in the box above.